"Dear Chinese Government, you are not infallible, today websites are hacked, tomorrow it will be your vile regime that will fall," the message read in English. "So expect us because we do not forgive, never. What you are doing today to your Great People, tomorrow will be inflicted to you. With no mercy. Nothing will stop us, nor your anger nor your weapons. You do not scare us, because you cannot afraid an idea." Some of the messages were directed at the Chinese people while others addressed the government. Some websites that Anonymous said it attacked were working Thursday, and government officials denied the sites were ever hacked. China's National Computer Network Emergency Response Technical Team was not available for immediate comment. The hacks were announced on March 30 on a Twitter feed, @AnonymousChina, and through a list posted to the programmer website Pastebin. 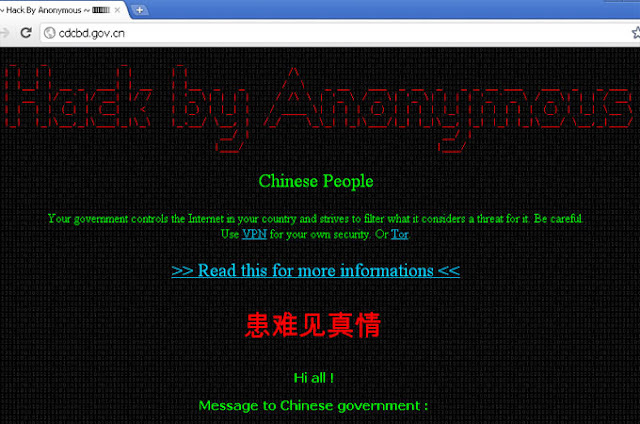 Anonymous also included a link to a page of tips on how the Chinese people could get around the "Great Firewall" of China, though the link now appears to be broken (it was reportedly hosted on the hacked sites' servers, so this makes sense). In March the Chinese government announced tighter control of the Internet in the country, arresting more than 1,000 users and deleting at least 200,000 messages it said were harmful.Operators of more than 3,000 websites have also received warnings, while restrictions were recently imposed for three days on the use of microblogging sites, of which more than 300 million users have accounts for.